The World’s Premier Mineral Exploration & Mining Convention (PDAC) is the leading convention for people, companies and organizations in, or connected with, mineral exploration. The convention is expected to have 1,000 exhibitors, 3,500 investors and 25,600 attendees from 135 countries. The convention also comprises of technical sessions, short courses and networking events. Today, PDAC is said to be the event of choice for the world’s mineral industry. 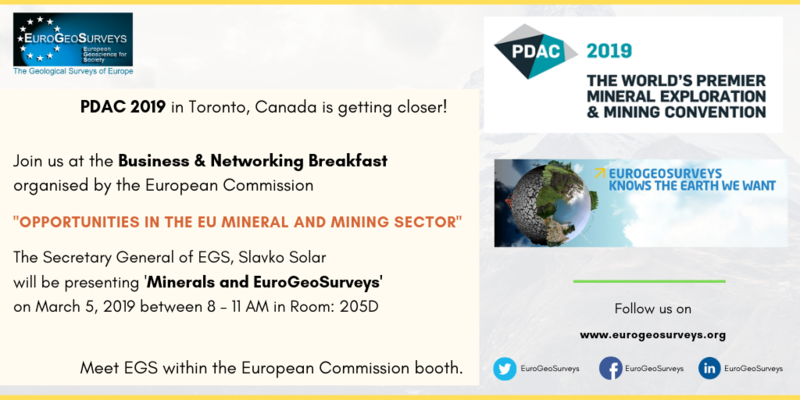 EuroGeoSurveys will be sharing the booth with the European Commission at the PDAC Convention. Check out the postcard to learn about the EGS activities at the PDAC Convention. Click here to know about the session where EGS will be participating. For more details visit the PDAC website. Please, do not hesitate to contact us in case of any question. The General Assembly 2019 of the European Geosciences Union (EGU) will be held at the Austria Center Vienna (ACV) in Vienna, Austria, from 7–12 April 2019. It is the largest geosciences meeting in Europe, which brings together thousands of geoscientists from all over the world into one meeting covering all disciplines of the Earth, planetary and space sciences. It provides an opportunity for science communicators to talk to researchers, learn about new developments and find out about the latest discoveries in a variety of areas, such as climate, space and planetary science missions, natural disasters, and plastic pollution. EuroGeoSurveys will be having a booth and two abstracts were accepted at the EGU Conference. 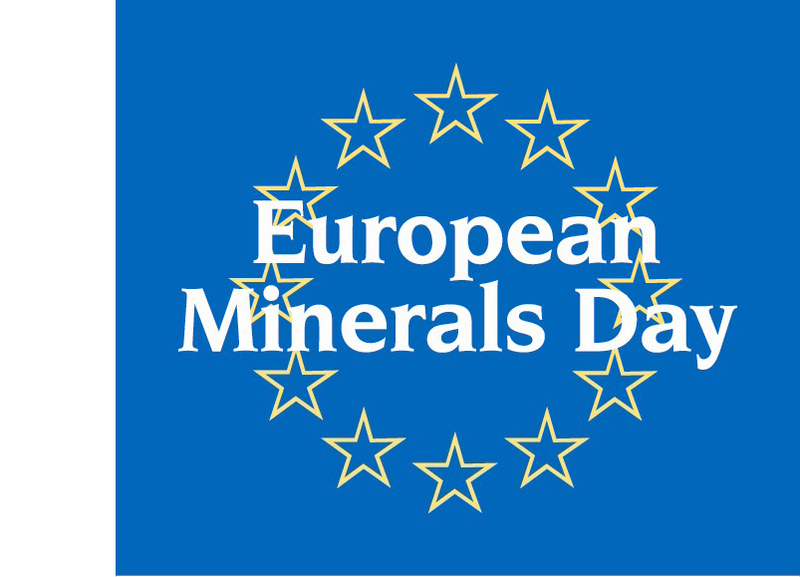 Establishing a Geological Service for Europe by Jelena Vidovic et al. Unimpeded production and supply of energy and raw materials underpins the realization of the Sustainable Development Goals (SDGs). Resource management experts, including representatives from government institutions, international organizations, industry, professional societies, associations, civil society and academia, will gather in Geneva to discuss the development and application of the United Nations Framework Classification for Resources (UNFC) and the United Nations Resource Management System (UNRMS). UNFC and UNRMS, which accommodate environmental and social considerations, provide a unique model for the sustainable management of renewable energy, mineral, petroleum, nuclear fuel and anthropogenic resources, as well as injection projects. Groundwater resources are now also being addressed. Progress on initiatives to adopt UNFC and UNRMS in Europe, Africa, Latin America, Eurasia and Asia-Pacific. The draft agenda and other documents for the meeting will be posted to the UNECE website over the coming weeks. Additional information regarding the Week, including how to register, or if you need a personalized letter of invitation and/or visa support letter, is provided below. Please Register Online. No other method of registration is possible. If you have problems registering please contact:[email protected]. There is no registration fee to participate in any of the events during the Week. To continue the tradition of European workshops on 3D geological modelling that took place in the past years, the Swiss Geological Survey cordially invites you to join the community between May 21st – 24th 2019 in Berne – Switzerland. The mistakes we make in the subsurface today can hardly be corrected in the future. The meeting is inspired by the emerging role of 3D geological modelling with respect to spatial planning in the underground. Besides the benefits of 3D geological modelling for society, the meeting shall also address case studies, advances in research and software development, trends, data dissemination, data infrastructure, application in resource management and demos related to the main topic. It focus on European GSOs, their needs, practical solutions and open knowledge exchange. However, exchange with academia and industry is much appreciated. We offer four conference blocks (slots for 30 talks of 15 min each, poster sessions and two break-out sessions), accompanied by two excursions and two social events - surrounded by the beautiful scenery of the city of Berne. Click here to check the attached First circular file for more detailed information. The call for abstracts will be sent out early next year. Please, do not hesitate to contact us in case of questions. 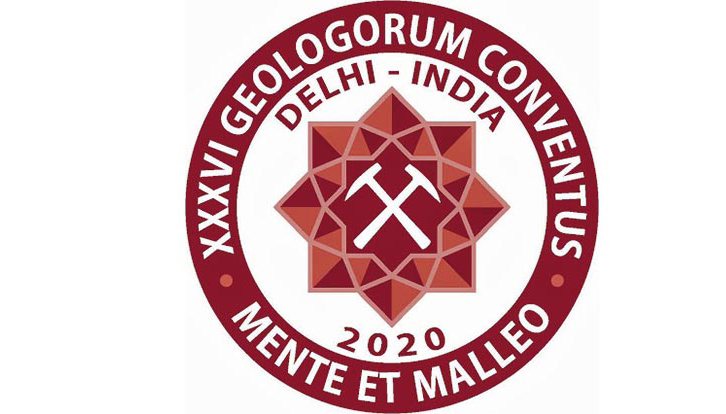 The Earth Observation and Geohazards Expert Group (EOEG) is delighted to announce the dates of its annual meeting conference, set from 3-7 June 2019. Besides the annual meeting, which is set on 7 June 2019, the EOEG will arrange trainings and activities with a special regard to geohazards. In order to know more download the week agenda .